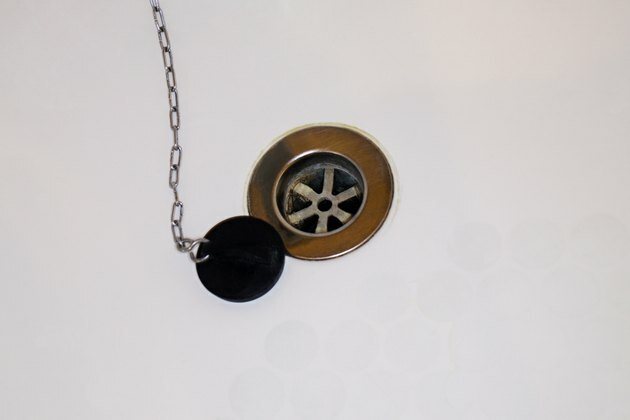 Musty smells are common in drains, especially the bathtub drain where large amounts of water and dirt are constantly washed down the drain. The dark, moist area inhibits mildew growth so you not only have the odor to worry about. but also the mildew itself. Use a cleaning solution that deodorizes while also cleaning the walls of your pipes. This takes care of the entire problem and leaves your drain smelling fresh. Deodorize your tub drain with baking soda. Pour 1/2 cup baking soda into the drain to clean and deodorize. Pour 1/2 cup vinegar into the drain directly on top of the baking soda. The vinegar itself holds cleaning and disinfectant qualities that will break up mildew growth, and when the vinegar mixes with the baking soda it foams and cleans the drain walls. Let the foam work in the drain for an hour and pour about 1 gallon boiling water down the drain for a final rinse. Repeat at least once per month to keep the drain odor-free.